Behind every order of coffee from Griffin Grounds there is a story, a student. A student like freshman Caleb Smith, who is not that different from everybody else despite the fact that he is in a special education class. Smith has been working at Griffin Grounds since the coffee shop opened two months ago in the library. “It’s really fun to work there. I get to have more conversations with people which is cool because I’m a really friendly person and I love talking to everybody but it’s something I just don’t really get the chance to do all the time,” Smith said. 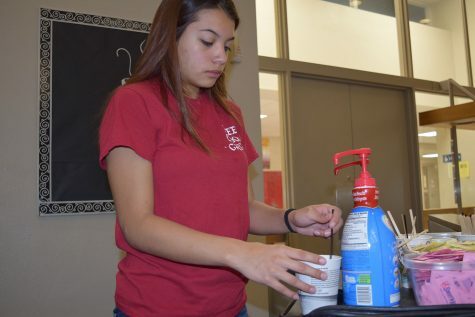 Special education paraprofessional Larry Magariel has seen a change in his students’ behavior since they have started working at Griffin Grounds. Sophomore Destiny Fossett, who has been working alongside Smith since the opening of Griffin Grounds, agrees that being able to meet new people is the best part of working there. Sophomore Jordyn Turncheck at Griffin Grounds adding creamer to her coffee on Nov. 7. Griffin Grounds is more than just a coffee shop, it is also an integral part of the special education department’s funding and a deciding factor in the opportunities that are awarded to students within the department. Senior Cayla Adamson also works at the coffee shop. She is one of just two students who work there that do not take special education classes, although she enjoys visiting the special education classrooms. Adamson is not alone. According to Magariel more and more students have begun to take an interest in the special education department. According to Adamson, students within the special education program do not get the recognition they deserve. Smith himself said that he has felt the effects of generalizations about students in special education classes. But according to Smith, Griffin Grounds may be helping to change that false perception. Fossett has also felt the effect of Griffin Grounds since she started working there. For Adamson, the impact of the coffee shop on Tonka’s student population is clearly visible. Adamson, Fossett, Magariel and Smith all have the same wish, for more students to start conversations with those in special education classes and for not only Tonka but also the rest of the world to see these students for who they really are.